Irvine – For the second game in a row, the Newport Harbor girls lacrosse team found itself down by three goals at halftime. But unlike its quarterfinal game against Trabuco Hills, where the Sailors rallied and won, second-seeded Foothill didn’t allow the Sailors to come back. The Knights used stifling defense to beat Newport Harbor 10-3 on Saturday at Portola High School in the U.S. Lacrosse Southern Section South Division semifinals. Foothill will play in its third consecutive championship match against top-seeded Mater Dei on Wednesday at Irvine High School at 5:30 p.m. The Monarchs edged St. Margaret’s 9-8 in the other semifinal. “Not to take away from our attack, but I was so so proud of our defense. Our defense had a game plan and they stuck to it. They played so hard today,” Foothill Coach Kate Hick said. A hot start also benefitted the Knights, as they scored the first three goals of the game. The Sailors didn’t get on the board until Adena Rothbard scored a free position goal at the 6:58 mark of the first half. After Foothill got two more goals, Rothbard scored another free position goal, and eventually, the Knights only led 5-2 at halftime. But that was as close as the Sailors got as they were shutout for most of the second half, and didn’t score until the last minute of the game. “Their defense was strong, it’s always strong. They’re tenacious on both ends of the field and their goalie had a bunch of good saves,” Newport Harbor coach Matt Armstrong said. 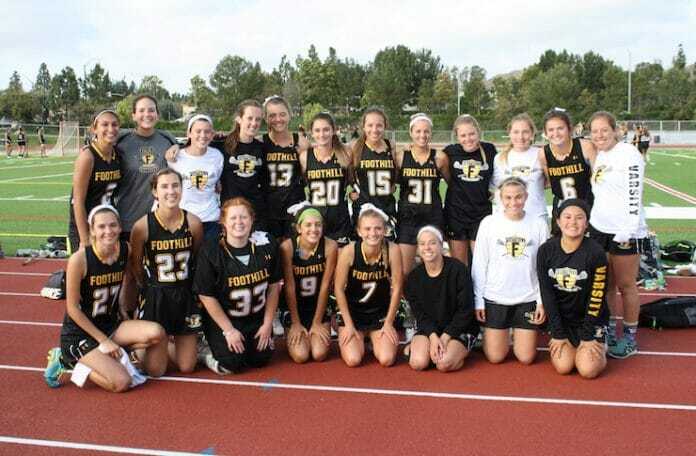 The two teams met earlier in the season, where Foothill beat Newport Harbor 11-5 on April 6 at Estancia High School. Rothbard led Newport Harbor (13-6) with two goals. Sarah Farley had Newport Harbor’s other goal while goalie Jade Rettig had five saves. Foothill was led by Lauren Kilger who had three goals, while Ashley Stokes and Emma Gaughan had two goals apiece. Brooke William, Sydney Boyd and Ava Brand had one goal apiece and goalie Becca Nailon had eight saves. The Knights will get a chance to become the first Orange County team since 2015 to knock off Mater Dei, as the two teams play in the county championship. The Monarchs beat the Knights 10-7 on April 4, but Hick is confident that the Knights can come out on top. “We’re really excited to see Mater Dei again. We’ve seen them so much, we know who they are. We match up really well with them and they’re a very attack-oriented team and I feel we’re a defensive oriented team, and so it’ll be a fun matchup to see their attack against our defense,” Hick said.